As part of the registration process on the Website through any medium, SPENCER’S may collect the following details personally identifiable information about you: Name including first and last name, alternate email address, mobile phone number and contact details, present and permanent address, Postal code, Demographic profile (like your age, gender, occupation, education, address etc.) and information about the pages on the site you visit/access, the links you click on the site, the number of times you access the page and any other information related to your browsing experience. The Services of the Site are made available to Select geographies in India as demarcated from time to time. Persons who are "incompetent to contract" within the meaning of the Indian Contract Act, 1872 are not eligible to register for and use the Site. Any person who is below the age of 18 years should not register as a member, or use the contents of this Website. Spencers grants you a limited sub-license to access and make personal use of this Website through any medium and not to download (other than page caching) or modify it, or any portions of it, except with express written consent of SPENCER’S. The Website through any medium and its source code is exclusive property of SPENCER’S. This license does not include any resale or commercial use of this site or its contents; any collection and use of any product listings, descriptions, or prices; any derivative use of this site or its contents; any downloading or copying of account information for the benefit of another merchant; or any use of data mining, robots, or similar data gathering and extraction tools. This site or any portion of this site may not be reproduced, duplicated, copied, sold, resold, visited, or otherwise exploited for any purpose without express written consent of SPENCER’S. You may not frame or utilize framing techniques to enclose any trademark, logo, or other proprietary information (including images, text, page layout, or form) of the Site or of SPENCER’S and its affiliates without express written consent. You may not use any meta tags or any other "hidden text" utilizing the Site’s or SPENCER’S’s name or trademarks without the express written consent of SPENCER’S. Any unauthorized use terminates the permission or license granted by SPENCER’S. Further, You are prohibited from Violating or attempting to violate, including, without limitation: (a) accessing data that is under any circumstance not intended for You or logging onto a server or an account which You are not authorized to access; (b) attempts to probe, scan or in any other manner test the security and safety of the website www.spencersretail.com without written confirmation from Spencer’s; (c) illegal and unauthorized attempts in interfering with the services made available to You or any other user of this website, any host or related network, including, but not limited to introducing a virus to the Site or system, overloading, forced crashing, server flooding, spamming in any applicable way, "mail-bombing" of the site and related systems (d) sending unsolicited emails, promotions or any other form or manner of advertising of products and services; or (e) forging TCP/IP packet headers. Any violation as specified above, or as may be detected may result in the attraction of civil and criminal liabilities. All Users including You and other shoppers are required to register and login in case it is necessary for Your interaction with the Site. It is your sole responsibility to keep your account and registration details current and correct for communications related to your interactions from the Website through any medium Your account and password are personal as it pertains to you and the same may be used only by you to access the Spencer’s Site, and that you shall not assist any other person from getting access to the Website by way of your account. You further agree to be responsible for maintaining confidentiality of your passwords and other account identifiers which you choose to provide to the website, and all activities that occur under your account. By agreeing to the terms and conditions of registration, the User agrees to receive promotional communication upon registration. You can opt out by contacting customer service. In the event You become aware of any unauthorized activity emanating from our account, you agree to immediately notify Spencer’s of the same. That you will use the services provided by the SPENCER’S, Stores/Website through any medium, its affiliates, consultants and contracted companies, are for lawful purposes only and comply with all applicable laws and regulations while using and transacting on the Site. You will provide authentic and true information in all instances where such information is requested. SPENCER’S reserves the right to confirm and validate the information and other details provided by you at any point of time. If upon confirmation your details are found not to be true (wholly or partly), it has the right in its sole discretion to reject the registration and debar you from using the Services and / or other affiliated Website without prior intimation whatsoever. That you are accessing the services available on this Website through any medium and using the information provided by the site at your sole risk and are using your best and prudent judgment before entering into any transaction through this Site. Gaining unauthorized access to computer systems that you have no authorized access to. Interfering with any other person's use or enjoyment of the Website through any medium/. Interfering or disrupting networks or web Website through any medium/ connected to the Website through any medium/. Attempt to reverse engineer source code of this website wholly owned and operated by Spencer’s under any circumstances. Making, transmitting or storing electronic copies of materials protected by copyright without the permission of Spencer’s. Spencer’s has made every effort to display the products/information that appear on the Website / as accurately as possible. However, in case of products,the actual image you see will depend on your monitor/gadget screen, we cannot guarantee that your gadget’s display of any colour will be accurate. In case of information, You should always contact Spencer’s for confirmation regarding the information displayed on the Website, in case you are required to act on it. SPENCER’S may at any time modify the Terms & Conditions of Use of the Website through any medium without any prior notification to you. You can access the latest version of these Terms & Conditions at any given time on the Site. You should regularly review the Terms & Conditions on the Site. In the event the modified Terms & Conditions is not acceptable to you, you should discontinue using the Service. However, if you continue to use the Service you shall be deemed to have agreed to accept and abide by the modified Terms & Conditions of Use of this Website through any medium/. This User Agreement shall be construed in accordance with the applicable laws of India. The Courts at Kolkata shall have exclusive jurisdiction in any proceedings arising out of this agreement. Any dispute or difference either in interpretation or otherwise, of any terms of this User Agreement between the parties hereto, the same shall be referred to an independent arbitrator who will be appointed by SPENCER’S and his decision shall be final and binding on the parties hereto. The above arbitration shall be in accordance with the Arbitration and Conciliation Act, 1996 as amended from time to time. The arbitration shall be held in Kolkata. The High Court of judicature at Kolkata alone shall have the jurisdiction and the Laws of India shall apply. All reviews, comments, feedback, postcards, suggestions, ideas, and other submissions disclosed, submitted or offered to the Site on or by this Website through any medium or otherwise disclosed, submitted or offered in connection with your use of this Site (collectively, the "Comments") shall be and remain the property of SPENCER’S. Such disclosure, submission or offer of any Comments shall constitute an assignment to SPENCER’S of all worldwide rights, titles and interests in all copyrights and other intellectual properties in the Comments. Thus, SPENCER’S owns exclusively all such rights, titles and interests and shall not be limited in any way in its use, commercial or otherwise, of any Comments. SPENCER’S will be entitled to use, reproduce, disclose, modify, adapt, create derivative works from, publish, display and distribute any Comments you submit for any purpose whatsoever, without restriction and without compensating you in any way. 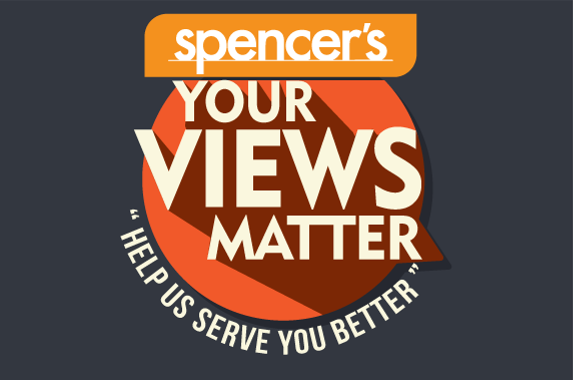 SPENCER’S is and shall be under no obligation (1) to maintain any Comments in confidence; (2) to pay you any compensation for any Comments; or (3) to respond to any Comments. You agree that any Comments submitted by you to the Website through any medium will not violate this policy or any right of any third party, including copyright, trademark, privacy or other personal or proprietary right(s), and will not cause injury to any person or entity. You further agree that no Comments submitted by you to the Website through any medium will be or contain libellous or otherwise unlawful, threatening, abusive or obscene material, or contain software viruses, political campaigning, commercial solicitation, chain letters, mass mailings or any form of "spam". SPENCER’S does not regularly review posted Comments, but does reserve the right (but not the obligation) to monitor and edit or remove any Comments submitted to the Website through any medium. You grant SPENCER’S the right to use the name that you submit in connection with any Comments. You agree not to use a false email address, impersonate any person or entity, or otherwise mislead as to the origin of any Comments you submit. You are and shall remain solely responsible for the content of any Comments you make and you agree to indemnify SPENCER’S and its affiliates for all claims resulting from any Comments you submit. SPENCER’S and its affiliates take no responsibility and assume no liability for any Comments submitted by you or any third party. SPENCER’S, its suppliers and licensors expressly reserve all intellectual property rights in all text, programs, products, processes, technology, content and other materials, which appear on this Website through any medium Access to this Website through any medium does not confer and shall not be considered as conferring upon anyone any license under any of SPENCER’S or any third party's intellectual property rights. All rights, including copyright, in this Website through any medium are owned by or licensed to SPENCER’S. Any use of this Website through any medium or its contents, including copying or storing it or them in whole or part, other than for your own personal, non-commercial use is prohibited without the permission of SPENCER’S. You may not modify, distribute or re-post anything on this Website through any medium for any purpose. The names and logos and all related product and service names, design marks and slogans are the trademarks or service marks of SPENCER’S, its affiliates, its partners or its suppliers. All other marks are the property of their respective companies. No trademark or service mark license is granted in connection with the materials contained on this Website through any medium. Access to this Website through any medium does not authorize anyone to use any name, logo or mark in any manner. References on this Website through any medium to any names, marks, products or services of third parties or hypertext links to third party Website through any medium or information are provided solely as a convenience to you and do not in any way constitute or imply SPENCER’S endorsement, sponsorship or recommendation of the third party, information, product or service. SPENCER’S is not responsible for the content of any third party Website through any medium and does not make any representations regarding the content or accuracy of material on such Website through any medium. If you decide to link to any such third party Website through any medium, you do so entirely at your own risk. All materials, including images, text, illustrations, designs, icons, photographs, programs, music clips or downloads, video clips and written and other materials that are part of this Website through any medium (collectively, the "Contents") are intended solely for personal, non-commercial use. You may download or copy the Contents and other downloadable materials displayed on the Website through any medium for your personal use only. No right, title or interest in any downloaded materials or software is transferred to you as a result of any such downloading or copying. You may not reproduce (except as noted above), publish, transmit, distribute, display, modify, create derivative works from, sell or participate in any sale of or exploit in any way, in whole or in part, any of the Contents, the Website through any medium or any related software. All software used on this Website through any medium is the property of SPENCER’S or its licensees and suppliers and protected by Indian and international copyright laws. The Contents and software on this Website through any medium/ may be used solely as a resource. Any other use, including the reproduction, modification, distribution, transmission, republication, display, or performance, of the Contents on this Website through any medium/ is strictly prohibited. Unless otherwise noted, all Contents are copyrights, trademarks, trade dress and/or other intellectual property owned, controlled or licensed by SPENCER’S, one of its affiliates or by third parties who have licensed their materials to SPENCER’S and are protected by Indian and international copyright laws. The compilation (meaning the collection, arrangement, and assembly) of all Contents on this Website through any medium is the exclusive property of SPENCER’S and is also protected by Indian and international copyright laws. You understand that by using this Website through any medium/ or any services provided on the Website through any medium/, you may encounter Content that may be deemed by some to be offensive, indecent, or objectionable, which Content may or may not be identified as such. You agree to use the Website through any medium/ and any service at your sole risk and that to the fullest extent permitted under applicable law, SPENCER’S and its affiliates shall have no liability to you for Content that may be deemed offensive, indecent, or objectionable to you. You agree to defend, indemnify and hold harmless SPENCER’S, its employees, directors, officers, agents and their successors and assigns from and against any and all claims, liabilities, damages, losses, costs and expenses, including attorney's fees, caused by or arising out of claims based upon your actions or inactions, which may result in any loss or liability to SPENCER’S or any third party including but not limited to breach of any warranties, representations or undertakings or in relation to the non-fulfilment of any of your obligations under this User Agreement or arising out of the your violation of any applicable laws, regulations including but not limited to Intellectual Property Rights, payment of statutory dues and taxes, claim of libel, defamation, violation of rights of privacy or publicity, loss of service by other subscribers and infringement of intellectual property or other rights. This clause shall survive the expiry or termination of this User Agreement. This User Agreement is effective unless and until terminated by either you or SPENCER’S. You may terminate this User Agreement at any time, provided that you discontinue any further use of this Website through any medium/. SPENCER’S may terminate this User Agreement at any time and may do so immediately without notice, and accordingly deny you access to the Website through any medium/, Such termination will be without any liability to SPENCER’S. Upon any termination of the User Agreement by either you or SPENCER’S, you must promptly destroy all materials downloaded or otherwise obtained from this Website through any medium, as well as all copies of such materials, whether made under the User Agreement or otherwise. SPENCER’S's right to any Comments shall survive any termination of this User Agreement. Any such termination of the User Agreement shall not cancel any obligation or liability you may have incurred as a result of your usage of the website.